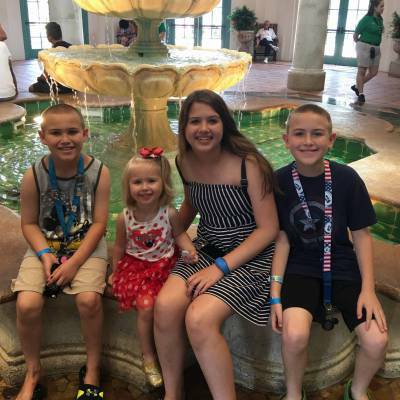 Last year Walt Disney World discontinued their Guest Assistance Card (GAC) program for guests with disabilities and replaced it with a new program, the Disability Access Service (DAS) Card. I had used the GAC in the past, which honestly, worked as a front of the line pass. 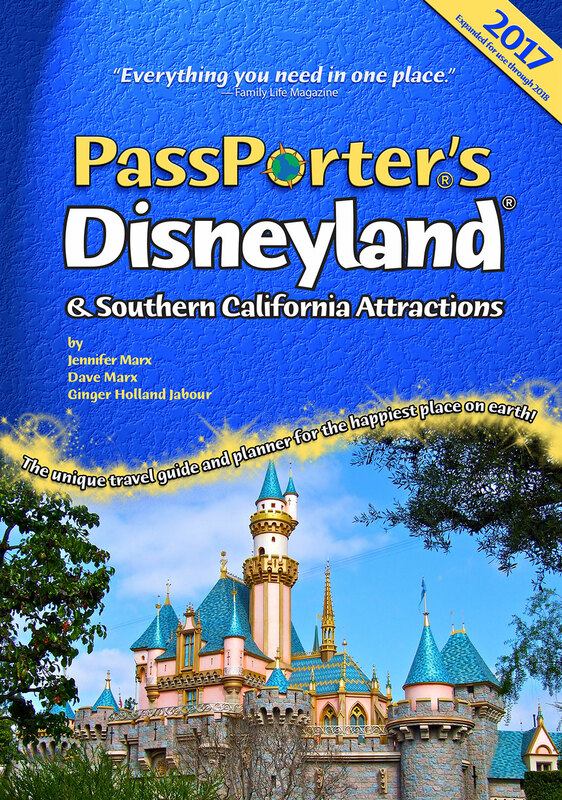 My son would refer to it as my "super FastPass." Often I felt as if I was taking advantage of the system; however, if I had to physically stand in line, I would be incapacitated before the end of one day. I have an unseen disability in a genetic condition called Ehlers-Danlos Syndrome (EDS). Due to my condition, I frequently dislocate my left hip and have instability in my lower spine and hips. That's compounded by osteoarthritis that I've had since my 30s. "You don't look sick," is a common refrain with EDS. When I stand in lines for longer than 15 minutes, due to the instability in my spine, I will experience back spasms and/or increased spinal cord compression causing my feet to go numb. Obtaining the DAS card was the most difficult part of the process. 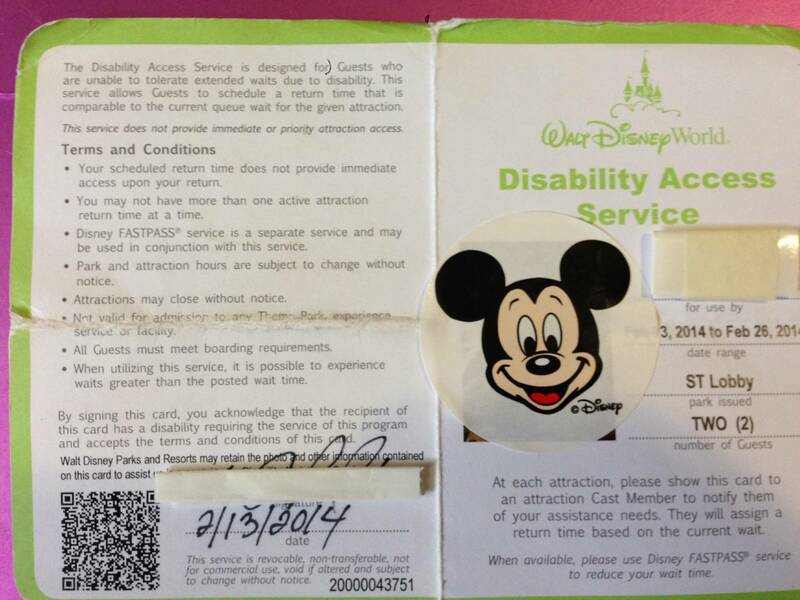 Disability Access Service Cards (DAS card for short) are available at Guest Relations locations both inside and outside the parks. I received mine inside the park at Disney's Hollywood Studios. When I spoke to the Guest Relations cast member at the window outside the park, he isaid I could obtain a DAS card there, but it might be more personable if I visited Guest Relations inside the park, without the window separating me from the Cast Member. I think this is sound advice, especially if you have a non-visible disability. To obtain my card, I entered Disney's Hollywood Studies and proceeded to Guest Relations. When I spoke with the Cast Member there, I started by indicating that I have Ehlers-Danlos Syndrome. The cast member did not want me to go into details. I explained that I need a DAS card because I can not physically stand in line for long periods of time. The Cast Member immediately suggested that I rent a wheelchair. I explained that was not feasible because not moving for long periods of time was nearly as bad (my muscles atrophy quickly). She emphasized that the DAS card was not like the Guest Assistance Card program. She informed me that I would need to come back to the ride after I signed up for the individual ride. The Cast Member confirmed my length of stay, the number in my party and took my picture. The card has rules of use and you must sign agreeing to follow the rules. Using the card is pretty straightforward. Approach any cast member at the FastPass+ (FP+) entrance to the ride. 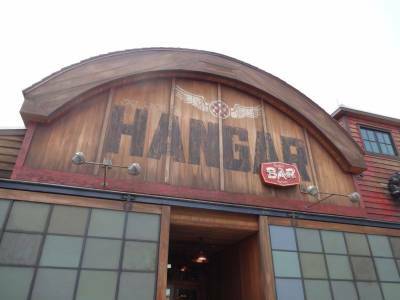 For popular rides such as Toy Story Midway Mania or Soarin’, you may be directed to a specific Cast Member. Your return time is the length of the standby wait time minus 10 minutes. You can return any time after that. You can shop, eat, rest, or whatever works for you. You can only have one active ride on your card. You return through the FastPass+ return. With the termination of the legacy FastPass system and the installation of the FastPass+ system, sometimes the FP+ entrance lines look very long. Don't be afraid, this is usually a backup at the entrance to the ride where people are tapping their Magic Bands or RFID cards to the Mickey Heads before entering the ride. There is frequently a hold-up at the first set of Mickey Heads; however, this line moves very fast and most people have caught the hang of it by the second set of Mickey Heads. With a DAS, instead of using the FP+ system, you show your card to the Cast Member at the FP+ entrance. The Cast Member checks your picture to confirm the person named on the pass is present. Keep the pass handy, it will be checked at the second set of Mickey Heads, where another Cast Member will cross out the ride info with a pen, indicating the return time has been used. 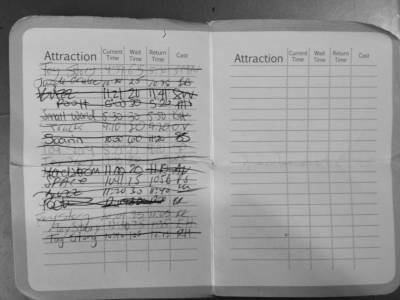 Occasionally, the first Cast Member will cross out the ride information; just inform the second Cast Member that the first Cast Member already did it. 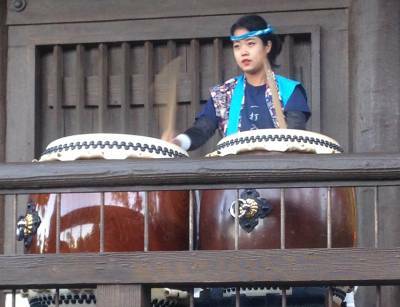 For the most part, the Cast Members at the ride entrances were very helpful. They made sure that I understood how the program worked and when to come back. On one occasion, a Cast Member pointed me to the nearest bench so I could rest. The exception to this was at the Mexican Pavilion at EPCOT. There was a bit of a line for the Gran Fiesta Tour. I approached the Cast Member there and asked if I could use the DAS card there and she said yes, gesturing to the shorter handicap access entrance. I called my sister over. When she arrived and we entered the front of the line we were redirected to the main part of the line by a second Cast Member. Since the speed of the line met my needs, I did not make a fuss. But if I were someone who could not handle crowds well, it could have been an issue as the lines switchback and are very close together. If you decide not to go on a particular ride that you signed up for, cross out the ride info yourself. 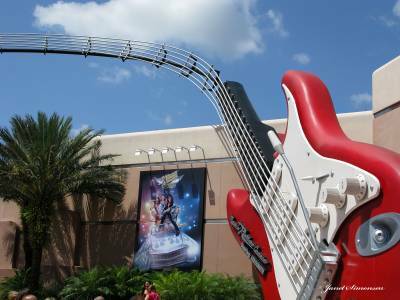 If you go to another park or different ride, the Cast Member may not sign you up for a new ride as you can only have one active reservation at a time. It may add a slight hiccup to the process. Do not try to game the system by writing in your own info for the ride. Each time you sign up for a ride, your card will be signed by a Cast Member. 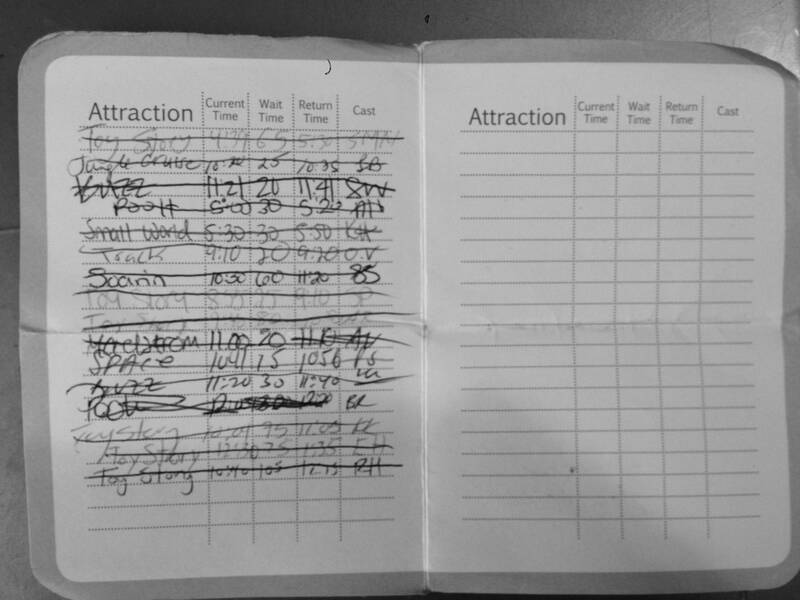 On the more popular rides, such as Toy Story Midway Mania, Disney has a specific Cast Member assigned to fill out the card and the color of pen used changes on a daily basis. If you need a DAS card, do not back down. Go to Guest Relations inside the gate. Talking to people face to face will make it more difficult for them to deny you. While on this trip, I met a family where the grandmother had just graduated from a mobility scooter after spinal fusion surgery. When offered the choice of a wheelchair, she refused and left Guest Relations without a DAS card. Later that day she collapsed and ended up spending a number of hours in urgent care. If you need the assistance, be as descriptive as you can in order to explain why you need it and why a wheelchair will not work. Personally, I like how the new program works. On an ethical note, I like it better. I feel less conflicted about using it now, and the program is fairer. At times in the past with the GAC program, I felt that I was taking advantage. 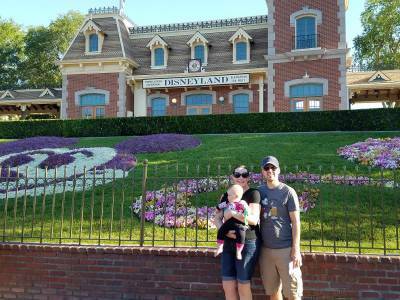 With planning and judicious use of the FastPass+ system along with the DAS card, touring the park with a disability can be done in an efficient manner. HP is an office drone with a deep appreciation of Walt Disney World and the customer service that Disney provides. This was a really useful article! Thank you.